Campaigners have vowed to continue the fight to stop HS2 going ahead despite the fact that a Conservative election victory should ensure a smooth path for the £50 billion high-speed rail project. An HS2 Hybrid Bill is going through Parliament with royal assent expected in December 2016 and work on the first phase, from London to Birmingham, due to start in 2017 for completion in 2026. A second, Y-shaped route extending the line north of Birmingham to Manchester and Leeds is due to be finished around 2032/33. Labour has been supportive of the project, but if the party had regained power in the election, its ministers were likely to have taken a close look at the cost of the scheme and also considered whether phase two was feasible. Former shadow chancellor Ed Balls warned there would be “no blank cheque” for HS2. Phase one will see a high-speed line going through Tory heartlands in the Chilterns where many residents and local councils are bitterly opposed to the project. Despite this, HS2 – and transport generally – appeared not to be a big issue in the general election campaign. Richard Houghton, spokesman for anti-HS2 group HS2 Action Alliance, said: “If people are not directly on the line of HS2, they don’t seem to care . “Unless the economy takes a complete nosedive, the new Government will push on with the project, although there must be some doubt about whether work will start as early as 2017. “We will continue our campaign of opposition. We still think this project is an enormous white elephant for which there is no business case, which is unaffordable and which will cut through areas of outstanding natural beauty. “There is no firm plan for the London terminus at Euston and there are fears that other rail services will be cut to pay for HS2. One Conservative MP determined to oppose HS2 is former Welsh secretary Cheryl Gillan, who has just retained her seat at Chesham and Amersham. The project could also face difficulties in its passage through the House of Lords. A recent report by the House of Lords Economic Affairs Committee said the Government had not yet made a convincing case as to why HS2 was necessary. The committee added that t he last Government set out two main objectives for HS2 – increasing capacity on the railway and rebalancing the economy – but had failed to make a convincing case for either. Mid Cheshire Against HS2 (MCAHS2) is an action group formed, in February 2013, to disseminate, inform and educate local and national opinion on the proposed HS2 project and its preferred route. MCAHS2 has concerns about a number of fundamental issues associated with the HS2 project; key amongst these are the cost, the effect on people and the environment and safety. The foundation stone of the project is ‘safety’ and the emphasis to be placed thereon by HS2 Ltd. and in turn the duty holder. High standards of ‘safety’ and in particular the terotechnology of the high speed rail infrastructure (i.e. its design and installation with respect to the safe operation and maintenance over its life span) have a significant effect on cost. Substantial pre-operational and operational expenditure (such as continual overnight inspections and maintenance of the entire high speed rail track) will be incurred in ensuring compliance with the strict safety tolerances required for high speed travel. MCAHS2 is concerned that those approving the HS2 project need to be reassured that HS2 Ltd. and the government of the day, in driving and paying for the project, have allowed sufficient funds to meet the terotechnological design, installation and maintenance costs. Local knowledge of the poor ground conditions where the HS2 proposed route crosses the Cheshire salt district has prompted MCAHS2 to raise concerns over whether enough capital investment has been budgeted to ensure the safety of the whole of the route of HS2. Specifically the local concerns relate to ground surface movement between Crewe and Wincham, over the past 30 years, which have exceeded the tolerances given by HS2 Ltd. for high speed rail track movement. · East of Stafford: where the HS2 route is underlain by mudstone with soluble salt beds where brine extraction has taken place since the 17th century; ceasing in the 1970’s due to ground subsidence. · North-east of Golborne: where the proposed HS2 route crosses an area of former coal mining with associated, flooded, ground subsidence – Pennington Flash. 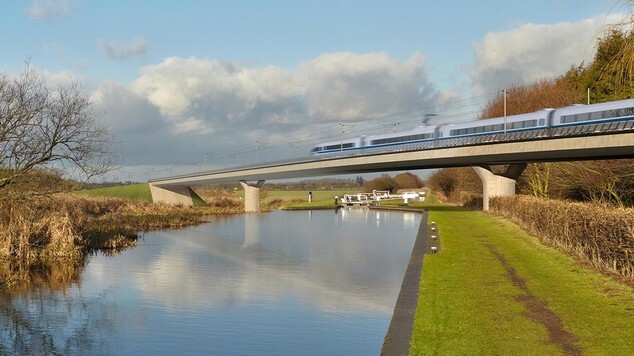 MCAHS2 is concerned that HS2 Ltd., who are responsible for commissioning and overseeing a project requiring a very high level of reliability, has made allowance for sufficient capital investment in the pre-operational design and specification for the whole route from London to Manchester and Leeds. MCAHS2 is also concerned that HS2 Ltd. has applied due diligence to ensure the overall robustness of the high speed rail project and especially the safety of the structures, systems and components (SSCs) over the lifetime of the entire project. One of the ways of measuring ‘safety’ of any project is in the standards imparted into the design, construction and commissioning. In the case of the proposed HS2 project MCAHS2, and indeed the nation as a whole, would expect all aspects of the rail system to be designed, constructed, commissioned and operated to the highest internationally recognised standards and quality. This philosophy has implications for the capital cost of the facility and calls for HS2 Ltd. to be developed as a High Reliability Organisation (HRO); particularly as the intention is to increase the maximum train speeds from 125mph to 225mph, a speed increase of 80% and hence kinetic energy increase of 324%. The absorption of such an increase in kinetic energy, in the event of a collision or derailment, would have a significant impact on the severity of the consequences of an accident; in terms of the number of fatalities. Potential HROs are not formally recognised by a certified body; however in the UK the concept has been investigated by the Health & Safety Executive (HSE). MCAHS2 would wish to know if the decision for HS2 Ltd. to join the ‘rail safety organisation’, Rail Safety and Standard Board (RSSB), means that it will raise its safety standards to that of an HRO and whether this will add costs to the HS2 budget. HROs are organisations that have succeeded in avoiding catastrophes in an environment where normal accidents can be expected due to risk factors and complexity. Important case studies in HRO research include both studies of air traffic control systems, naval aircraft carriers, nuclear power operations and disasters (e.g. the Three Mile Island nuclear incident, the Challenger explosion and Columbia space shuttle explosion, the Bhopal chemical leak, the Tenerife air crash, the Mann Gulch forest fire, the Black Hawk friendly fire incident in Iraq). This begs the question as to whether these have been analysed by HS2 Ltd. and operational and engineering safeguards, for HS2, introduced to prevent recurrence. Professor Woodward of Heriot Watt University, Edinburgh, told the Scotland Herald in February 2012 that the high speeds planned for HS2 may cause safety limits to be breached. He told The Engineer magazine he was worried about “ground waves” of vibration, known as Rayleigh waves, developing in the rail at a certain speed, which may cause “rapid deterioration of the track, ballast and sub-ballast, including possible derailment and ground failure”. As a “critical track velocity” is approached, the track could “start to undergo strong ground vibrations”, rippling visibly along the rails in front of the train and possibly causing the train to derail. In recent years there has been a huge increase in literature about the control of major hazard risks and in particular the philosophies of HROs, resilience management and safety culture. A number of major hazard organisations have been attempting to influence the organisational and safety culture at their sites to transform them into HROs (i.e. organisations that are able to manage and sustain almost error-free performance, despite operating in hazardous conditions where the consequences of errors would be catastrophic) with a positive safety culture. HROs operate in unforgiving social and political environments. Their technologies are risky and present the potential for error. Also the scale of consequences from errors or mistakes precludes learning through experimentation. To avoid failures these organisations use complex processes to manage complex technologies and complex work. Those approving HS2, on behalf of the whole of the UK and all potential users, need to be reassured that complex processes to manage HS2’s complex technologies and complex work are in place and have been rigorously assessed, modelled and tested. HROs share many properties with other high performing organisations including highly trained personnel, continuous training and professional development, effective reward systems, frequent process audits and continuous improvement efforts; initiatives which are relevant to HS2 Ltd.
· An organisation-wide sense of vulnerability. · A widely distributed sense of responsibility and accountability for reliability. · Widespread concern about misperception, misconception and misunderstanding that is generalised across a wide set of tasks, operations, and assumptions. · Pessimism about possible failures and redundancy. · A variety of checks and counter checks as a precaution against potential mistakes. A comparison can be made between the HS2 project and nuclear power stations both of which have a very high capital cost, thus making it difficult to procure investment, but reduced operating revenue resulting from the need for high reliability. The reduced operating costs, consistent with high availability and low examination, inspection, maintenance, testing, repair, like for like replacement, breakdown and obsolescence, have a positive effect on the safety of the workforce and public (because these activities are risky when conducted during operation of the facility); HS2 Ltd. should be seeking to achieve this pinnacle of performance. It is expected that the capital cost of HS2 should be high so as to sustain HS2 Ltd. as a HRO and thus be able to manage and maintain almost error-free performance despite operating in hazardous conditions where the consequences of errors would be catastrophic. Those approving HS2, on behalf of the whole of the UK and all potential users, need to be reassured that HS2 Ltd. are applying high standards of design, construction and commissioning; requiring the designation of a high safety classification to those structures, systems and components (SSCs) important to safety. This provides a high reliability facility, but at the expense of increased capital costs. Politically the HS2 project is sensitive to any increase in the total amount to be spent, including contingency for unforeseen expenditure. Those approving HS2 need to be confident that HS2 Ltd. and the government of the day, as organisations which should be aspiring to HRO standards, have allowed sufficient funds to meet the asset requirements of the SSCs. An example of the importance of the application of high standards of design is the management of the ageing of SSCs; vital to safety throughout any facility’s lifetime. During the lifetime of the proposed high speed, HS2, rail infrastructure (and the existing HS1 and other UK rail infrastructures) the climate of the British Isles is expected to change as the Earth continues to warm. The trend of year on year increase in severe weather, rainfall amount and intensity, driven by this global warming, will potentially continue. The relevance of increasing severe weather to rail infrastructure is highlighted by the Office of Rail Regulation (ORR) in their Annual Report of July 2013 in Section 3. “The moving annual average of wrong-side failure incidents increased in 2012-13, ending at its highest level since early 2011-12 but still lower than 2010-11. All categories, with the exception of track failures, increased in 2012-13 compared to 2011-12: earthworks, electrification and power failures increased, which illustrates weaknesses in Network Rail’s asset management. Several of these incidents also caused heavy impacts on service delivery. The graph below from page 39 of the ORR Annual Report July 2013 highlights the increase in earthwork failures. The South Devon Mainline at Dawlish, February 2014 (repaired April 2014). The Cambrian Coast rail line between Dovey Junction near Machynlleth via Barmouth to Pwllheli, February 2014 (still under repair as of April 2014). MCAHS2 would like confirmation that sufficient capital expenditure has been assigned to the HS2 project to take into account areas of existing and potential ground instability to be crossed by the proposed HS2 route. As supported by comments in the ORR July 2013 report ground instability can be initiated and exasperated by the increased rainfall amount, rainfall intensity, flooding and rising ground water levels as a consequence of the warmer, wetter and more turbulent weather we are already experiencing in the UK ; driven by global warming which is likely to continue. This map from the BGS website shows the extent of the reported sink holes in February 2014. · “TAIWAN will spend about US$1.8 billion (S$2.2 billion) to seal off nearly 1,000 wells over the next 10 years to save its high-speed rail, which has been threatened by subsidence.” as reported in 2011. HS2 Ltd., and the government of the day, must allow sufficient pre-construction funding of site surveys and evaluation to identify poor ground conditions; preventing them from becoming additional and expensive ‘unforeseen ground conditions’ during construction. Such concerns have also been voiced by David Nowell in Geoscientist, May 2014 Volume 24 No 4 pp10-15 (the monthly magazine of the Geological Society, the professional body representing UK geoscientists). “Ending systematic surveying is ultimately false economy”. “The phrase unforeseen ground conditions is often used to cover up expensive mistakes or the failure to undertake [pre-construction] cost-benefit analysis of likely ground conditions during construction”. HS2 Ltd. in HS2 Phase One has, because of inadequate pre-construction surveys and evaluation, left the door open for increases in the cost of the project due to unforeseen ground conditions. “initial 2009 report first phase states the corridor shown does not consider ground conditions”. MCAHS would like to be reassured that HS2 Ltd., operating as a High Reliability Organisation, would have made provision in the estimate of costs for this 21.5 kilometres length of foreseeable poor and unstable ground conditions on the section of the HS2 preferred route north of Crewe. “In Britain, salt (halite or sodium chloride) occurs mainly in the Permian and Triassic rocks of central and north-eastern England. Many towns on the Triassic strata have ‘wich’ or ‘wych’ in their names indicating that they are sited on former salt springs emanating from actively dissolving salt karst. These places became the focus for shallow mining and near-surface ‘wild’ brine’ extraction; a technique that exacerbated the salt karstification. Extraction of natural brine has ceased and modern exploitation is mainly in dry mines or by deep controlled brine extraction which leaves brine-filled cavities. Distorted railway lines near Crew[sic] caused by salt dissolution aggravated by past brine extraction. This image of distorted rail lines due to salt dissolution subsidence at Crewe shows how it is imperative to apply high standards of design relating to the management of the ageing of structures, systems and components for the safety throughout the whole life time of a high reliability facility such as HS2. HS2Ltd. has identified ground subsidence in the Cheshire salt district north of Crewe as an area of concern and MCAHS2 is also concerned that the existing and increasing rates of ground subsidence could be linked to the current patterns of high precipitation and wetter ground conditions in the UK, which would have major consequences on the safety and reliability of the HS2 high speed rail track in Cheshire. This is discussed in detail in the HS2 Phase Two Preferred Route Consultation Response on behalf of Mid Cheshire Against HS2, submitted 29th January 2014, and the HS2 Preferred Route Consultation Comments, written and submitted by Rosalind Todhunter PhD FGS CGeol., which are appended to this document. The MCAHS2 Consultation Response discusses three typical areas where there is active ground subsidence on the line of the proposed HS2 route; such as the 4 metre deep ground subsidence hollow at Greenheyes Farm. The locations of the three case study areas are shown on the map below; other areas of ground subsidence also occur. The three case study areas all have negative ground movement in excess of the 5mm upper limit for high speed rail tracks, quoted by an HS2 Ltd. engineer at Tatton HS2 Road Show on 7th December 2013. This 13 kilometre stretch of the HS2 route, from north of Crewe to Wincham, demonstrates that HS2 Ltd. needs to operate as a High Reliability Organisation and make considerable and sufficient pre-operational capital investment to ensure catastrophes are avoided in an environment where normal accidents can be expected due to risk factors and complexity. The concerns over ground movement in the Cheshire Salt District were raised with HS2 Ltd. at a meeting in January 2014. Cheshire residents met with Mr Andrew Went (HS2 Ltd. Head of Route Engineering) and engineers from Network Rail and Cheshire West and Chester Council. Mr Went implied that the high speed line would be constructed on grouted piles to depths of circa 100 metres in this area of ground instability. The piles would, therefore, penetrate the underlying salt beds and collapse residue, caused by natural salt solution and wild brine pumping. The dimensions and extent of solution cavities created by natural salt solution and wild brine pumping are likely to be highly irregular and their location hard to define. It can sometimes be inferred by surface collapse, although this can occur several kilometres from the site of the wild brine wells or natural salt springs. The high probability of soluble strata sensitivity to fresh water ingress and the presence of cavities of unknown extent and dimensions, beneath the proposed line of the HS2 route, poses significant uncertainties of the effectiveness of ground remediation measures prior to construction. Investigation and treatment of the subsurface structure by drilling, grouting and pile emplacement may cause problems by allowing fresh surface and fresh ground water ingress into the sub-surface salt bearing strata; leading to solution. The impact of displacing any existing sub-surface brine by the injection of the grout may create and reactivate brine issues and springs some distance from the grout/pile emplacement and change the hydro geological regime leading to fresh ground water ingress to soluble strata. Grouting of salt cavities is a relatively new procedure with little past experience to support its effectiveness. In Northwich, salt mine cavities were successfully grouted between 2005 and 2008. £32 million was spent grouting up the 750,000 cubic metres of salt mine cavities as the possibility of their collapse presented a threat to life and property. Urban renewal and development in Northwich was put on hold for decades because the ground strength was either not sufficient to support buildings or could only support, at best, light weight warehouse type structures; hence the plethora of free car parks in Northwich over the salt mine cavities. The known extent of the underground cavities prior to grouting allowed monitoring of their filling during grouting. Good mine plans existed and open mine shafts facilitated the carrying out of underground surveys. The cavities beneath the proposed HS2 line, however, are not the result of rock salt mining and are of unknown extent and dimension. Hence remediation of the ground conditions, for the 13 kilometre stretch through the Cheshire salt district, involving monitoring and testing during drilling and grouting/pile emplacement, and on completion and during operation over the lifespan of the high speed rail line will require substantial capital investment. The above example is of an engineering challenge for a 13 kilometre section of the proposed HS2 route. It illustrates that it is vital that those who will approve the whole HS2 project, on behalf of the UK taxpayers, potential passengers and those living along the route, should be confident that HS2 Ltd. have ensured adequate funding has been assigned to provide appropriate margins in the design of its structures, systems and components thus ensuring the high reliability and safety of the whole route of HS2 over the whole of its lifetime. Quoting the capital cost of a facility is meaningless without recourse to the intended design and build standards. Funding for the HS2 project must take into account relevant ageing and ‘wear out’ of mechanisms and potential age related degradation in order to ensure the capability of the SSCs to perform the necessary safety function throughout their design life. All potential ageing mechanisms for passive and active SSCs, including embrittlement, fatigue, corrosion, environmental assisted cracking, creep and wear, must be taken into account in the design. In turn HS2 Ltd. must ensure that relevant information on the factors affecting ageing management is provided to SSC manufacturers and is properly taken into account in the fabrication and construction of the SSCs. Clearly whilst this increases the capital costs of the facility it will reduce post operational ageing and degradation with the benefit of reducing operating costs (i.e. maintenance) and improving post operational safety. The workforce of the future duty holder, for HS2, and the general public would expect HS2 Ltd. to be a HRO and that the capital cost should reflect (and hence be increased by) the attainment of the highest standards of design, construction and commissioning which will be beneficial in increasing ‘safety’ and reducing revenue costs. MCAHS2 would ask HS2 Ltd. to provide a comprehensive statement supporting a claim to be a HRO and confirm that the figures being quoted for the capital cost of HS2 are consistent with providing a facility to be designed, constructed and commissioned to the highest international standards. Rosalind Todhunter PhD FGS CGeol.